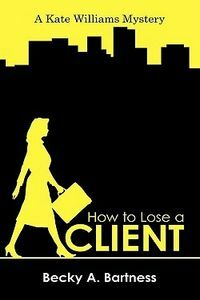 How to Lose a Client by Becky A. Bartness: Synopsis and Online Purchase Options. Synopsis (from the publisher): Kate Williams, Esq., has just started her own criminal defense law firm in Phoenix, Arizona, when Katherine Paar aka Tangerine, a new client, walks in and proposes a lucrative deal to bring Kate on as her attorney. Things get complicated and events unfold quickly when the body of Tangerine's ex-lawyer is discovered and Tangerine disappears. Kate, aided by MJ, her tattooed, pierced, and fashion-challenged paralegal and Sam, her sometimes cross-dressing investigator, along with a cast of characters straight out of a John Waters movie, try to unravel the bizarre mystery and save Tangerine's life.